In 2013, National released a consultation document on a proposed overhaul of the Resource Management Act. They claimed the RMA was holding back economic progress, was causing a disastrous housing shortage, and was forcing up the cost of development through wasteful bureaucratic processes. What has evolved has exposed the very worst of MMP politics. 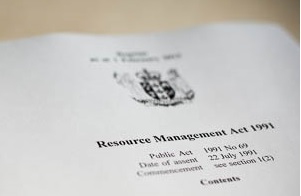 At the time, two of the government’s three coalition partners baulked at the idea of any resource management reforms that involved changes to the Purpose and Principles of the Act – sections 6 and 7. Neither Peter Dunne’s UnitedFuture Party, nor the Maori Party, could be convinced that economic development should be given the same weight in law as environmental protection. Only the ACT Party supported National’s call for a rebalancing of the law so economic benefits could be considered on the same footing as environmental concerns, when resource consents were being sought. But with the two parties being one vote short of a majority in Parliament, the reforms did not have the numbers to proceed and were shelved. National included RMA reform in their 2014 election manifesto, and once back in government outlined ten priority changes: adding natural hazards, recognising urban planning, prioritising housing affordability, acknowledging the importance of infrastructure, giving greater weight to property rights, introducing national planning templates, speeding up plan-making, encouraging collaborative processes, strengthening national tools, and making greater use of the internet. They planned to introduce a Bill into Parliament in the first half of this year, with a view to passing it into law by Christmas. With the support of ACT, National had the numbers. However, the sudden resignation of their Far North MP in late January, followed by the loss of the seat in the by-election, meant that National again needed two extra votes to pass any law through Parliament. While ACT still favoured a major overhaul of the RMA, UnitedFuture and the Maori Party remained opposed to changes to sections 6 and 7. The reforms were again at an impasse. “Several months ago, the Minister for the Environment provided UnitedFuture (and possibly the Maori Party although that is not entirely certain) with a list of 39 headline amendments he wished to make to RMA processes. UnitedFuture’s response, after a brief period of consideration was that many of the proposals appeared reasonable, some were clearly objectionable, and others required more information. I suggested the best way forward would be to release a public exposure draft of a Bill so that we could all see how the proposed amendments fitted together and could therefore be assured that the Government was not trying to change the RMA’s principles by stealth. When I discussed this with the Prime Minister in late June he agreed. “That was over four months ago, and nothing seems to have moved since. Various attempts have been made to find out where the exposure draft is at. We keep being told it is still being worked on. “UnitedFuture remains committed to working alongside like-minded parties on constructive amendments to the RMA’s processes, but to do so, we need to see the full details of what is being proposed. The devil, after all, is always in the detail. Clearly, Mr Dunne was prepared to support most of National’s planned reforms – with the bottom line being that they did not weaken sections 6 and 7. It is this understanding that makes last week’s announcement by National that they had secured the support of the Maori Party to introduce their RMA reforms into Parliament, so surprising – particularly since they had abandoned their proposed changes to sections 6 and 7. National claims they had to ‘compromise’ to win support for the Resource Legislation Amendment Bill – but by introducing the framework for iwi control over resource management in New Zealand, the changes look less like a compromise, and more like a sell-out. The point is that National had options. Having abandoned any hope of changing sections 6 and 7 of the RMA, they clearly knew that they could have worked with UnitedFuture and ACT to gain their support for the Bill. So, why would National agree to a radical deal with the Maori Party, when their other support partners would have stepped up? The RMA already contains provisions for consenting authorities to transfer their powers to iwi. Under the Section 33 Transfer of Powers, an iwi can become a full consenting authority, and under the Section 36B changes introduced by the Labour Government in 2005 (but opposed by National), they can become a joint consenting authority with a council. However, over the years, these clauses have rarely been used – except for the Section 36B Joint Management Agreement signed between Ngati Porou and the Gisborne District Council last month. While this agreement, which was instigated by their 2012 Treaty settlement, will give the iwi joint control of water in the Waiapu Catchment, it is just a starting point – the iwi plans to move to full Section 33 consenting authority powers over a 5 year period, with control over the entire region. The Maori Party’s new Iwi Participation Agreements will require councils to formalise their consultation with iwi and abide by their recommendations. The Bill stipulates that within a month of a new council being formed after an election, they must contact all iwi in their area to begin establishing these agreements. To ensure iwi objectives are taken seriously by councils, annual reviews of progress must take place. And if any difficulties arise, the Minister will step in. It is now clear that these agreements have been designed to provide a fast-track mechanism by which any iwi, any where in the country, can demand the right to become joint or full resource management consenting authorities for the control of water and other natural resources in their area. No other law changes will be necessary. “The proposed amendments to the Resource Management Act announced just a few days ago make it abundantly clear that we are well down the track of accepting that we are not really one people at all, but two distinct groups with different political rights – one group claiming at least one Maori ancestor (even if with a majority of non-Maori ancestors) and the other larger group with no Maori ancestor. With the National Party still claiming equal citizenship as one of their core values, many New Zealanders had hoped their RMA reforms would remove special rights for iwi – but instead, they are strengthening them. So how have other parties responded to the Bill? The Labour Party’s Nanaia Mahuta said National’s changes to include Iwi Participation Agreements have not gone far enough. Labour wants to include the “mandatory” recognition of iwi management plans by councils – and to press for that change, they are urging all whanau, hapu and iwi to make submissions on the Bill. And iwi leaders have congratulated the government, saying that the new bill is a “positive first step in advancing Maori participation in resource management processes”. The reality is that what National is trying to do is scandalous – on many fronts. We know it was always their intention to allow iwi to control fresh water – catchment by catchment, council by council – because that’s what Nick Smith told reporters back in April. That’s why we launched our Keep Water Kiwi public information newspaper advertising campaign – to ensure New Zealanders are aware of their plan. But how they were planning to facilitate the transfer – on the scale needed – was unclear. Now we know it will be through the new Iwi Participation Agreements and the powers already available under Section 33 and 36B of the RMA. Let’s be clear about what’s going on here. The MMP tail (the Maori Party) is wagging the dog (the National Party). National has sold out the principle of equality – just so they can have a more comfortable ride in government. What they are doing is shameful – and very, very destructive. Who could have imagined when National came into office, that today they would be planning to hand over control of water to iwi? Radical and corporate Maori will not stop at water. They want to take power and control away from our democratically elected government, for their own selfish motives. And although the country has been on a slippery slope since Sir Geoffrey Palmer foolishly and naively introduced the Treaty Principles into legislation in 1986, under National, the slope has become a whole lot steeper. What’s worse is that they are not pushing the country towards separatism by force – they are allowing iwi to gain sovereignty over water and other natural resources by choice, since they had other options to get their RMA reforms through Parliament, that wouldn’t have required them to put iwi demands ahead of the rights of all other New Zealanders. What we now know is that the water reform discussion paper, expected to be released early next year, will not include a mechanism for iwi to gain control of water. That mechanism is already in this RMA reform bill under the guise of the innocent-sounding Iwi Participation Agreements. It will be up to the public to vigorously oppose their inclusion in the Bill in submissions to the Select Committee – if they believe that fast-tracking iwi control of water and other natural resources is not in New Zealand’s best interest. Do you support National’s plan to establish ‘Iwi Participation Agreements’ in their RMA reform bill? At the last election, the people had the opportunity to vote for parties who campaigned on one law for all. They rejected that, and now we suffer the consequences. Maori were, & still are a primitive tribal people who invented nothing more than a sharp stick. Consequently, without the free ride that this morally bankrupt National Party offers, they would continue to get nowhere & do nothing, just as they do anyway. But now of course they demand to be paid for it. Still pleased you ticked both boxes for National ?? A.G.R.